Below we've listed some of the questions we've received about our neighborhood, the Association and our website. 1.1 Who can join the Whittington Valley Neighborhood Association? What are your membership requirements? 1.2 Can I deduct my WVNA dues off my taxes? 1.3 When does the Neighborhood Association meet? 1.4 Are you a traditional HOA (Home Owners Association)? Do you assess monthly HOA fees? 1.5 Do you enforce a list of design restrictions (CC&Rs) like a HOA? 2.1 How can I get a copy of your cookbook? 2.2 Great idea posting recipes from your cookbook on your website. But won't you eventually run out of recipes? 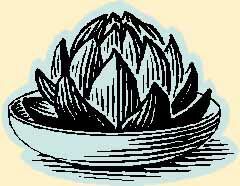 2.3 Your cookbook is entitled "Alligators & Artichokes." What does the title mean? 3.1 Where exactly is the Whittington Valley? 3.2 Your neighborhood sounds great. Are there any houses or lots for sale in the Valley? 3.3 How much does a typical house in the Valley cost? 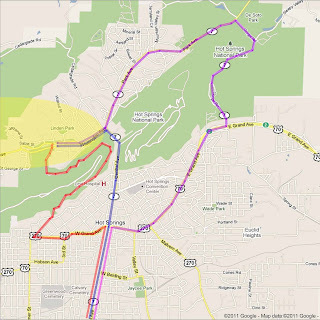 3.4 How do I get out of the Valley and across town (I live near the racetrack) when Central Avenue is closed? 3.5 Why are you so proud and positive about your neighborhood? 3.6 Why are you always arguing with City officials about their plans for your neighborhood? 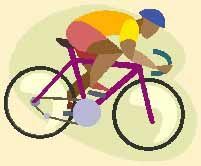 3.7 Are Valley residents anti-bike? 4.1 What day is the trashed picked up? 4.2 Who should I call to have some broken furniture and large appliances taken away? 4.3 Does Hot Springs have a recycling program for household waste? 4.4 Who do I call to report that a street light is burned out? 4.5 Who are our utility providers? 4.6 My electricity just went out. Who should I call? 4.7 I want to get internet service. What are the available options for Valley residents? 4.8 Is there a city agency that will pick up stray dogs and cats? 4.9 My neighbor's dog barks continuously at night (after 10:00 pm). Is there any city department that can help me? 5.1 How often do you update your website? 5.2 Who designed your website? 5.3 Do many people visit your website? 5.4 Do you allow advertising on your Website? Who can join the Whittington Valley Neighborhood Association? What are your membership requirements? Can I deduct my WVNA dues off my taxes? When does the Neighborhood Association meet? 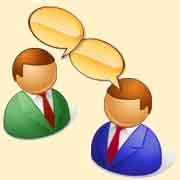 Are you a traditional HOA (Home Owners Association)? Do you assess monthly HOA fees? Do you enforce a list of design restrictions (CC&Rs) like a HOA? How can I get a copy of your cookbook? Great idea posting recipes from your cookbook on your website. But won't you eventually run out of recipes? Our Cookbook has two-hundred pages and contains nearly three-hundred recipes. We have plenty of recipes to post online for the foreseeable future. 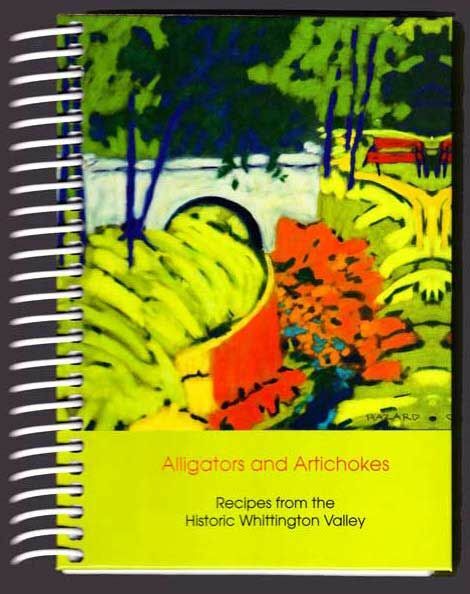 Your cookbook is entitled "Alligators & Artichokes." What does the title mean? Where exactly is the Whittington Valley? Your neighborhood sounds great. Are there any houses or lots for sale in the Valley? As a general rule, there are always some property for sale in the Whittington Valley. We are a small community so the available housing stock may be limited at any particular time. Most houses are older but affordable. And there are usually some buildable lots for sale on which you can construct a new house if you are so inclined. How much does a typical house in the Valley cost? How do I get out of the Valley and across town (I live near the racetrack) when Central Avenue is closed? 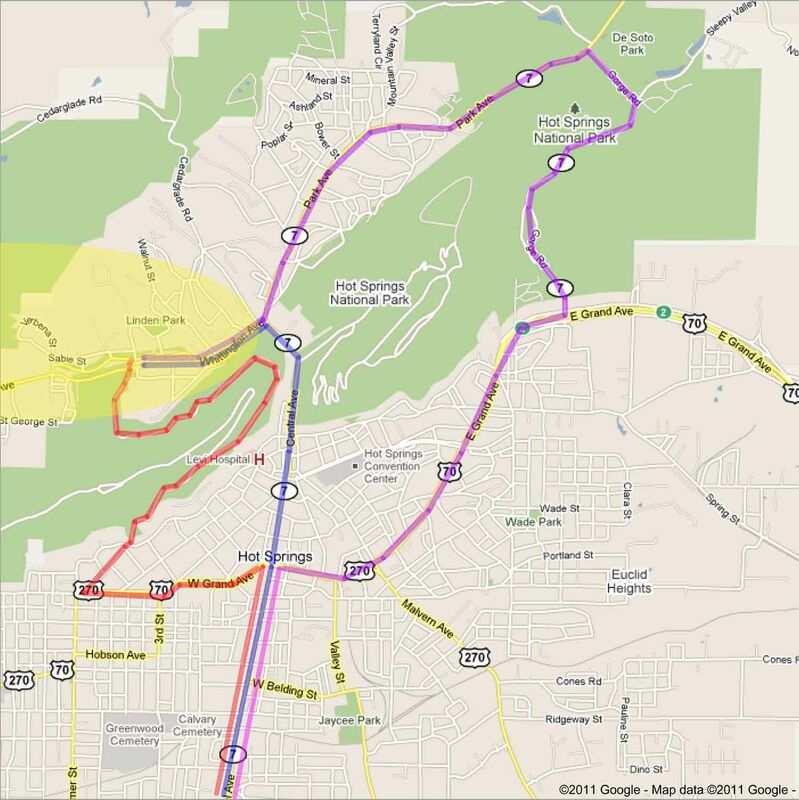 There are three main routes connecting the Whittington Valley (located in the northern part of Hot Springs) with the southern parts of the city. First, you can take Central Avenue through downtown (shown in blue on map below). This is generally recognized as the shortest and most direct route connecting the Valley to locations south. However, during special events such as holiday parades, Central Avenue through Downtown may be closed for short periods (2-3 hours at a time). Another popular route is over West Mountain (shown in red). 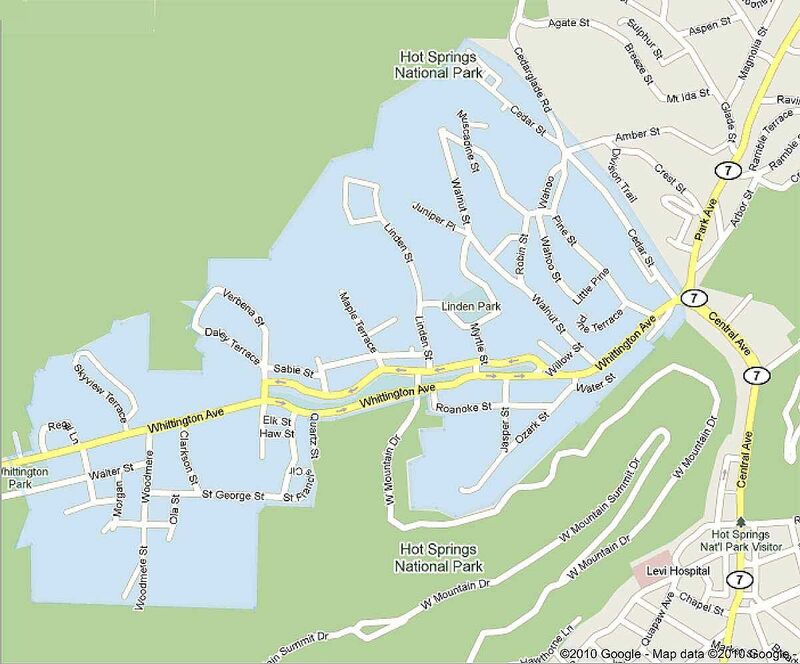 In the 500 block of South Whittington, take West Mountain Drive through the National Park (over West Mountain) to Prospect Avenue. Once on Prospect, cut over to Pecan to reach Grand Avenue. This route is very scenic but watch your speedometer-- the 25 MPH speed limit over the mountain is strictly enforced. Why are you so proud and positive about your neighborhood? Short answer: because it's a great place to live. The Valley is beautiful. We are surrounded by the National Forest on all sides. Whittington Federal Park, which runs down the middle of the Valley, is a vibrant green ribbon filled with towering one-hundred year-old magnolia trees. brightest students in the state, is located in the Valley. Why are you always arguing with City officials about their plans for your neighborhood? We have worked amicably with City officials on many projects in our neighborhood. But because there was no conflict or disagreement, our cooperation with City officials did not generate much coverage in the media. 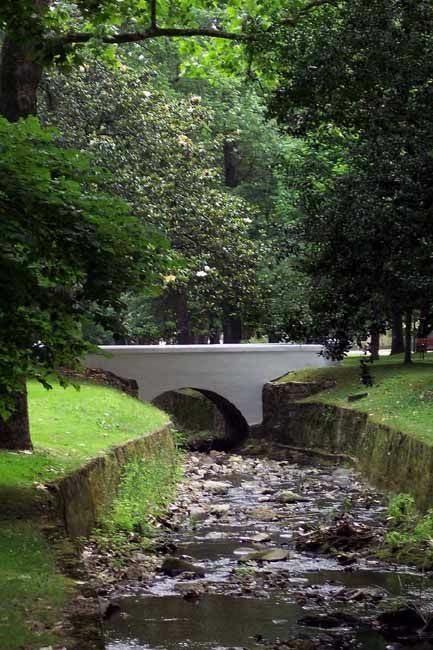 For example, in the Fall of 2010, we partnered with the Hot Springs Parks and Recreation Department to obtain a Federal Grant to improve the Valley's own Whittington City Park. The process was amenable and very productive and the improvements in the park should be in place sometime in 2013. Likewise, in April 2011 we worked with City officials to have a road in the Valley added to the City's 2011 Paving program. In 2012 we worked to obtain another federal grant, this time to begin repairs to the sidewalks around Whittington Federal Park. There have been a few other instances, however, where we have disagreed with City officials. On these occasions, local officials have advanced proposals that we felt were inappropriate for our neighborhood. What day is the trashed picked up? Who should I call to have some broken furniture and large appliances taken away? 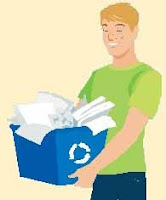 Does Hot Springs have a recycling program for household waste? Who do I call to report that a street light is burned out? Who are our utility providers? 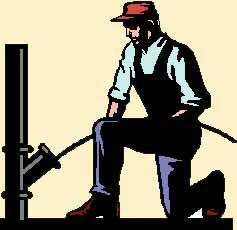 Water and Sewer service is provided by Hot Springs Municipal Utilities, phone: (501) 623-6880. Land line telephone service is provided by AT&T (phone: 1-800-288-2020) as well as other service providers. For a complete listing of such providers, see the front of your telephone directory. VoIP service is offered through Resort Television Cable, phone: (501) 624-5781. Cable TV Service is provided by Resort Television Cable, phone: (501) 624-5781. My electricity just went out. Who should I call? To report an electrical outage, call Entergy at 1-800-968-8243 or 1-800-9OUTAGE. I want to get internet service. What are the available options for Valley residents? DSL service through AT&T or other providers. However DSL service is subject to transmission limits and may not be available at your particular location. 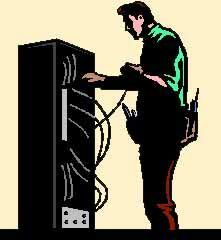 Call AT&T or another DLS provider to see if DSL service is available at your house. AT&T can be contacted at 1-866-596-8455 or visit their website at www.att.com. Note: AT&T sometimes offers bundled services (for example DSL & Wireless & Landline) at reduced prices. Be sure to ask about any available specials or bundled specials. Currently prices start at about $25 per month (for the slowest speed) and go up from there. Another DSL provider is Earthlink. 501-624-5781 or visit their website at www.resorttvcable.com. Note: Resort Cable sometimes offers bundled services (for example Internet & Cable TV & VoIP Phone Service) at reduced prices. Be sure to ask about any available specials or bundled specials. Currently prices start at about $25 per month (for the slowest speed) and go up from there. 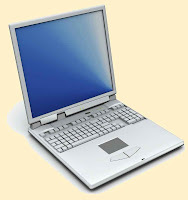 You can also obtain wireless internet service from a variety of providers. Wireless is a good choice if you have a laptop and want to have internet connectivity when you take your laptop on the road. Check your Yellow Pages under "Internet Access Providers" for a list of local providers. 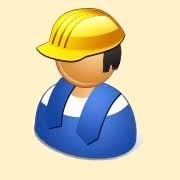 You can also obtain wireless internet service through national companies like Sprint, Verizon and AT&T. Check the white pages for the phone numbers for these national providers. Typically, prices start about $45 per month for wireless internet and go up from there. Is there a city agency that will pick up stray dogs and cats? My neighbor's dog barks continuously at night (after 10:00 pm). Is there any city department that can help me? The Hot Springs City Code specifically prohibits keeping "...any animal or bird which causes or makes frequent or long and continued loud sound, including but not limited to barking, whining, howling, [and] yelping... [and which is] plainly audible and disruptive to persons who reside in the vicinity...." Owners can be cited if the dog barks "continuously for a period of fifteen (15) minutes or more at any time of day or night with few, if any, brief breaks or periods of silence" (H.S.C 4-5-4.5). If you are having problems with a barking dog, call the Police Department's non-emergency number at (501) 321-0789 and report the problem. An officer will be dispatched to resolve the situation. Note: when you call the police, you will need to provide the address where the dog is--that is, the dog owner's address. Do many people visit your website? Do you allow advertising on your Website? Which web host do you use?